General Motors NZ brought this japanese market Isuzu with hydraulically raised sides to a show and transport operators conference at Palmerston North. 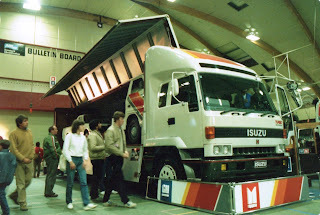 Inside the Pascal Street sports stadium. 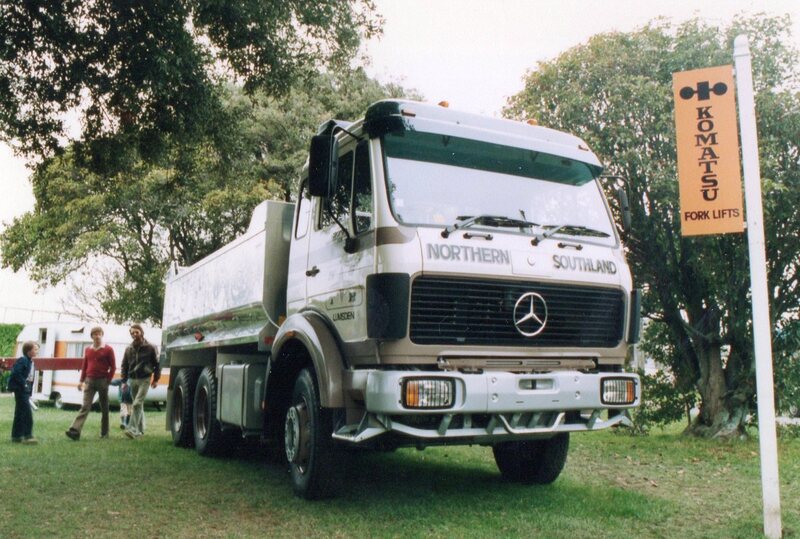 Outside, at the same event, was this brand new Mercedes Benz for Northern Southland Transport Services. NSTS were big users of Mercedes Benz and MAN. 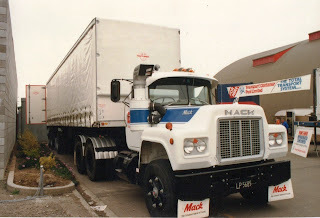 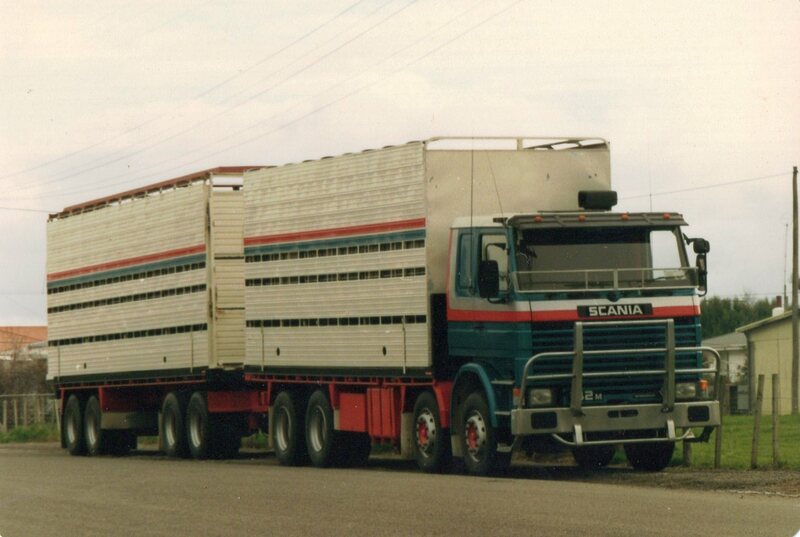 Again at the same event, an R series Mack with self steering, curtain sided semi. 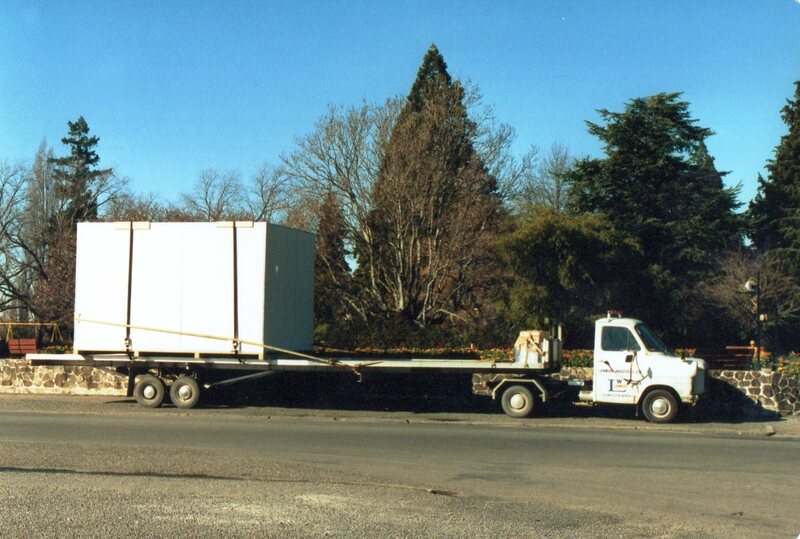 Little Ford with long trailer takes a break by Queen Elizabeth Park in Masterton with a walk in chiller, on delivery to a butcher's shop or supermarket. 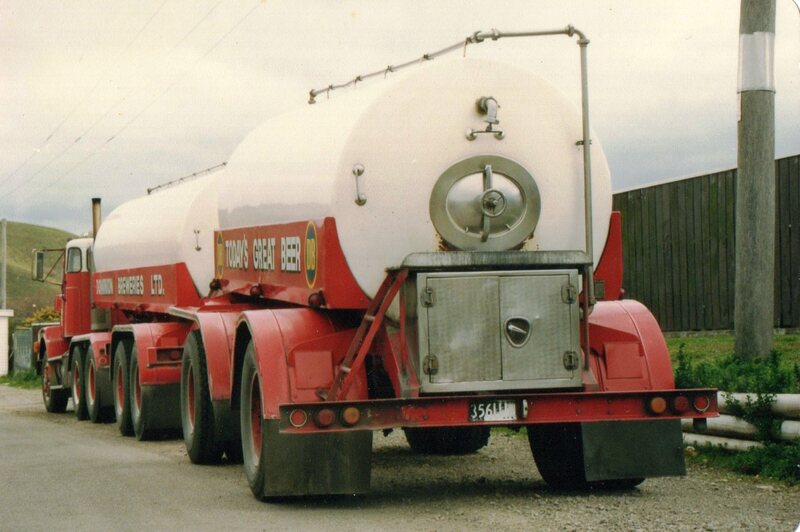 Rear view of Volvo N10 beer tanker A-train. 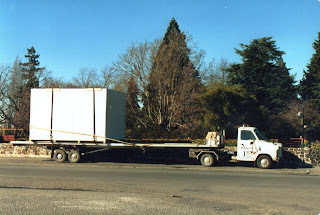 NZ Express 4x2 Nissan about to couple up to a furniture trailer. 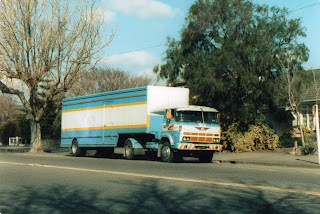 Another furniture truck. This one belonging to Jarret Sandes of Palmerston North, but photographed in the picturesque town of Cambridge. Cummins powered Scammell S26 fuel tanker unloads some of Caltex's precious liquid at Solway Service Station before it had a roof over its pumps. 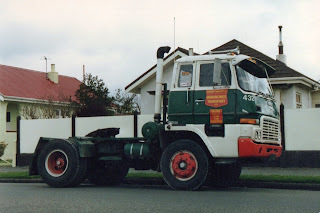 Scania R142M of David Pope Transport in typical New Zealand stock truck configuration. 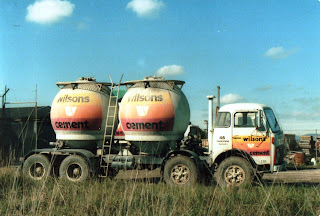 8 wheeler Volvo F86 with cement containers. 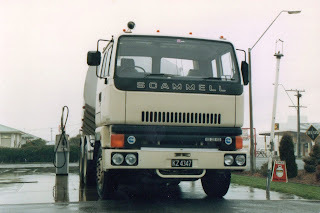 This model sometimes referred to as the "bubble cab". 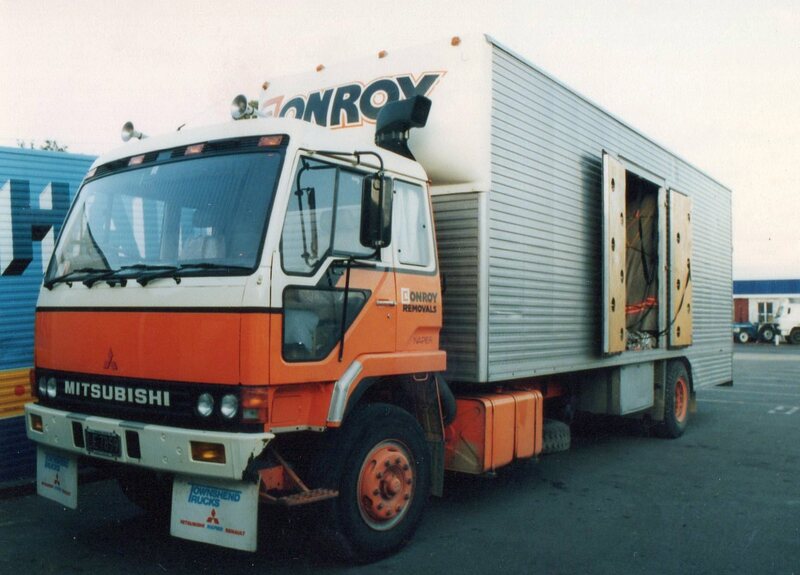 Mitsubishi rigid furniture truck, from 1984. 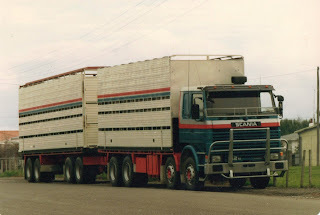 A common livery in the 80s. 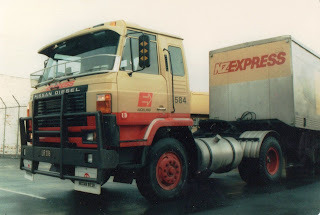 This 4x2 Isuzu in the colours of Hargreaves Transport.